Within that 44 lurk at least 20 of those being what we'd consider a favorite or a wild card with the potential to win. That's almost 50% of the field being a chance to become or defend A1! Current Australian Champion Darren Kane puts the #1 Ian Boettcher Race Parts Dominator into battle with 2017 champion Callum Harper looking to relieve Kane of the burden of the national target on his back. And effectively repay the favor from last year. Of course, Harper did take Kane's Aussie Super Sedan title in the process. They've got their own bartering system those two! Americans Joe Godsey and Jeff Roth represent Uncle Sam in a field containing drivers from Tasmania, South Australia, West Australia, QLD and NSW over two torrid nights. South Australian youngster Ryan Alexander has now elevated himself into a higher wild card position after his stout and maiden win last Saturday night at VR. The NSW stars are desperate to hold back the dam as the interstate and international invaders ascend on their back yard. 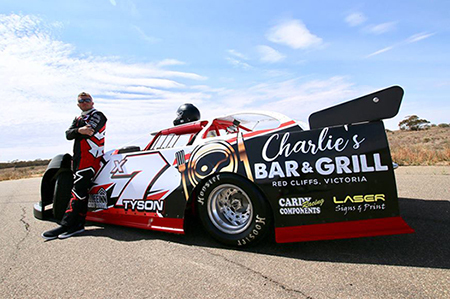 Robbie Farr looks to create history in adding the Australian Late Model Championship to his incredible racing resume that surely makes him the most broadly successful driver in Australian Speedway history. Should the driver of the Hi-Tec Oils Longhorn Chassis win it will add to his already rapid rising credentials including SA Late Model Champion in his rookie season. NSW heavyweights, proven race winners or podium contenders Ryan Fenech, Clayton Pyne, David Doherty, Nathan Disney, Darryl Grimson, Lachlan Onley, John Lodge Jr and Ben Nicastri lead the 'blues into battle' in this State of Origin of slide. The reality is that anyone can win this though. Sure, the guys like Kane and Harper will be in the middle of the mosh pit but South Aussie whizkid Ryan Alexander proved last weekend that this is anyone's house if you get it right. There are wild cards littered throughout this field like gold flecks in a panhandler's palm and come Saturday night we'll either be crowning someone that everyone said would win, or sitting there going "wow, I didn't see that coming but he sure did earn it." And that's the tastiest part of this title. We gratefully acknowledge the support of the Holiday Inn Parramatta where many of the race teams are staying this week and encourage fans and teams alike to book in by calling (02) 9891 1277. Thursday night sees the popular "Calcutta" bidding draw and it will be conducted on Facebook LIVE on the NSW Late Models page. If you plan to bid, please register in advance. Thursday will also see scrutineering and some pre-race filming for the www.clayperview.com.au coverage. It's a big three nights ahead at Valvoline Raceway.